Do you know that tune from Jaws? Dun dun....dun dun dun dun. That's what we hear whenever we see a creeper coming for us in Minecraft. First it's just one but if you don't move fast then you'll be in real trouble. The blocky country that's so lush with possibilities and prospects has plenty of dangers as well. If your kiddo is a fantastic Mincrafter then they've been foiled by the frustrating creepers before. Those darn Creepers crop up whenever the light gets dim, perfect monster action! These green blockheads are really maddening, they don't even have to get that close to you before they explode. They can even take down your house if you don't do anything. There are ways to avoid damage, of course. Keeping your distance you can use bows and arrows or fire and lava, and some impressive pixelated explosives if you can get your blocky hands on them. 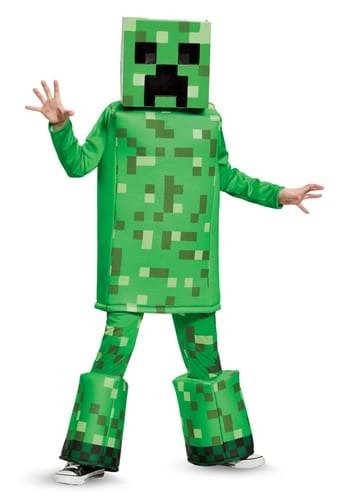 The fear of Creepers is something that can't be understood by someone who doesn't craft, so if you don't play then you have to try and understand how scary these guys are, perfect for Halloween! 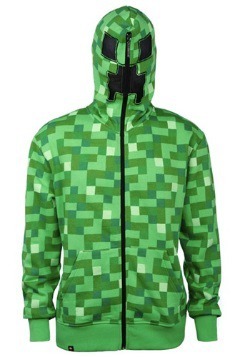 Your kiddo will find it easy to transform into one of these Creepers with this costume. It features a tunic, pants with blocks on the end, and a blockhead mask with mesh eye openings. They will look just like the dreaded Minecraft monster, a vision that'll send crafters packing especially if your child pairs up with multiple Creepers. There's nothing as scary as a mob, after all! Can you hear it? dun dun....dun dun dun dun.